Origin: Eastern Australia from northern Victoria into Queensland. Landscape Use: Strong vertical, commercial to large residential, mesic, tropical or alpine character, popular for shade in parks, lawn tree. Form & Character: Upright and pendulous, conical when young to more spreading with age, tropical, mesic. Growth Habit: Woody evergreen perennial tree, vigorously upright to 60 feet, pyramidal when young but spreading with age. 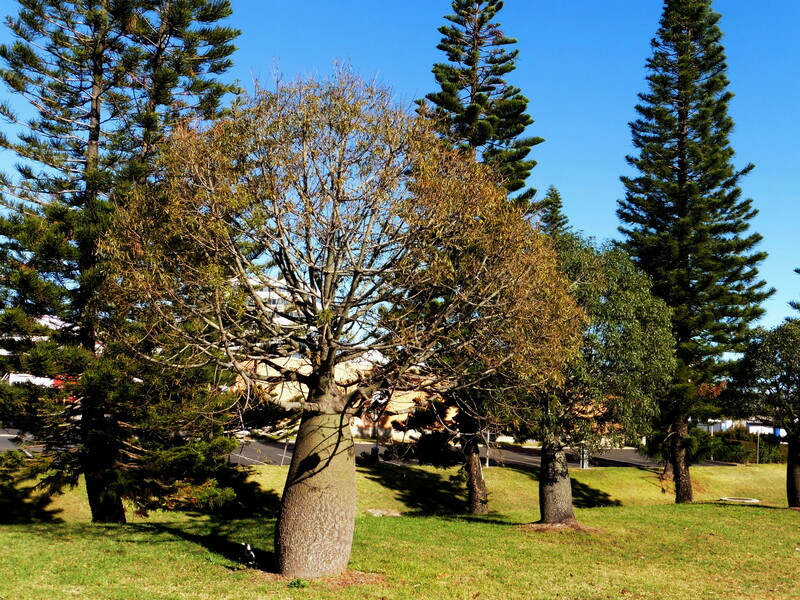 The bottle tree trunk is generally smooth and gray (except where heat stressed) and tends to flare at the base. The main scaffold branches are generally thick and extending upwards, sometimes perpendicular. Foliage/texture: Foliage generally light green and ovate and entire (aspen like) to 3-5 lobed (turkey track), mostly 3 inches long or less; medium texture. 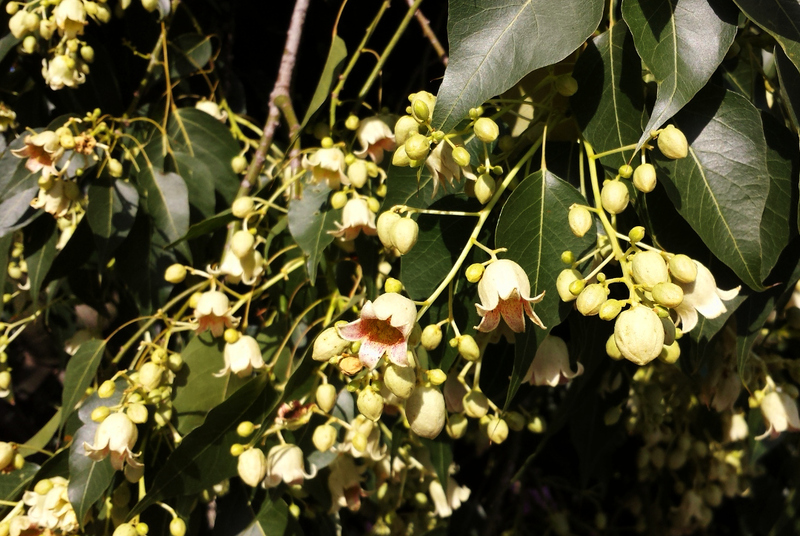 Flowers & fruits: Clusters of bell shaped, yellow-green flowers with yellowish red inside on short, axillary panicles (on a stalk), spring time. Fruits are hard, woody canoe-shaped, persistent, then messy. Light: Full sun, though hot summer western sun can scald the trunk. Soil: Bottle trees show foliar interveinal chlorosis in soils with pH above 8.0. Watering: Irrigate bottle trrees deeply at least twice a month during summer for best results. Pruning: Elevate canopy base, but avoid western sun exposure on main trunk (sunscald time). Propagation: Seed; majority of seed lot will germinate with turkey track (3-5 lobed) leaf form and minority will have aspen like foliage (ovate). 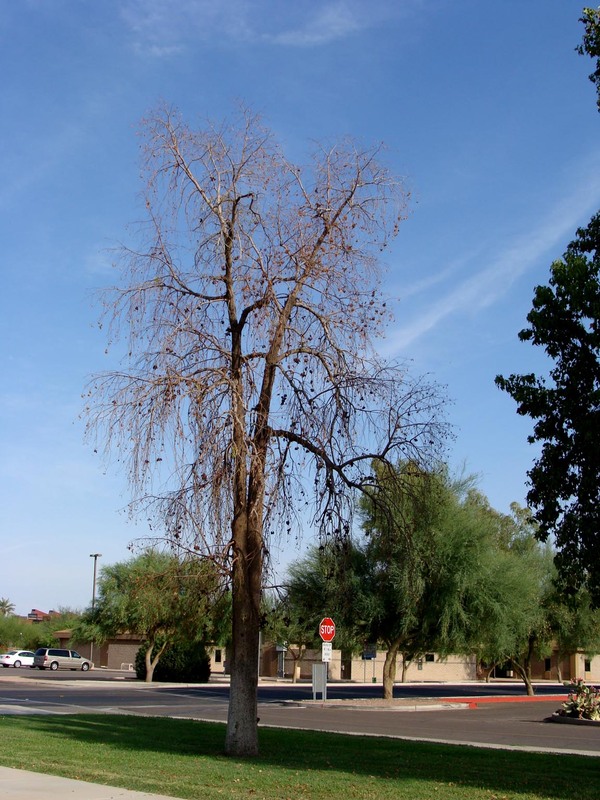 Disease and pests: Bottle tree is highly susceptible to Phymatotrichopsis (common name, Texas root rot) in former agricultural soils in the Phoenix area. Local Texas root rot symptoms include abrupt leaf browning and tree death usually sometime during July to October (mostly September after soil temperatures exceed 80oF). 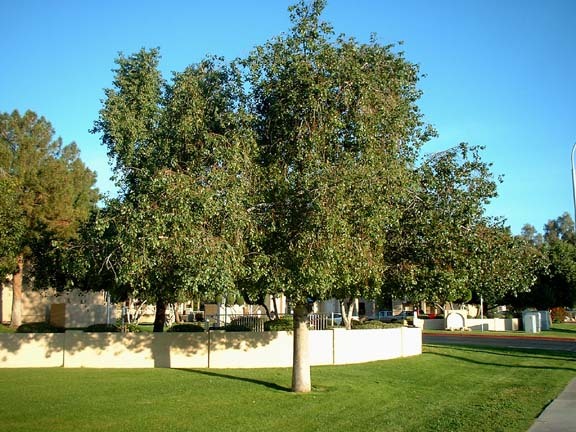 Additional comments: Bottle trees were widely planted in Phoenix during the 1970s and 1980s as a dominant element of mesic and oasis landscape design themes - oh, how times have changed! Bottle tree fruit pods are resistant to decay, pose a litter problem and can injure bare foot wanderers and reel lawn mowers. Young bottle trees are subject to wind throw especially if their roots have been deformed by prior culture in nursery containers. Flame Tree (B. acerifolius) is somewhat taller with red flowers. The genus Brachychiton contains 31 species of trees and shrub, all native to Australia (30 species) and New Guinea (one species). Many have odd, bulbous trunks for the storage of water during extended periods of dryness such as this Brachychiton rupestris I came across in a landscape streetscape in Toowoomba, Australia. 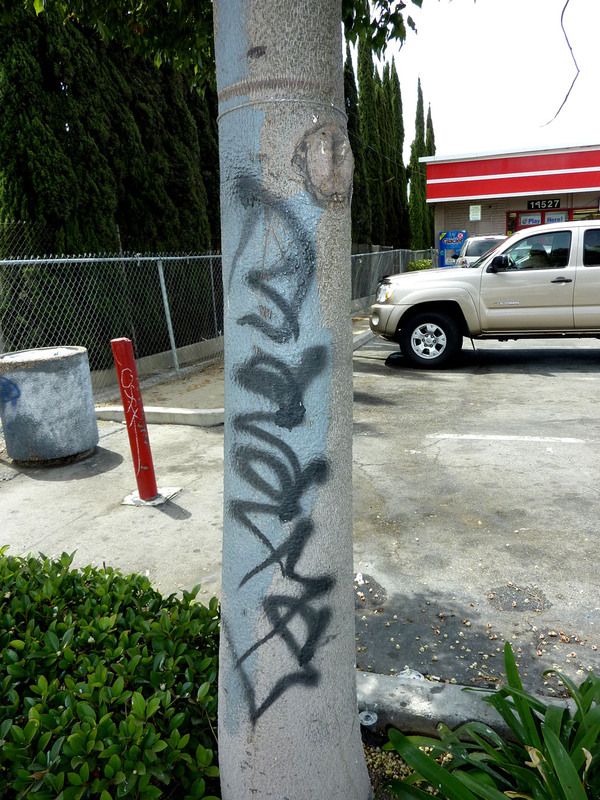 Vandalism is a problem in dense urban areas because bottle tree has such a smooth trunk.